Teleseminar & Self-Study Coaching Program: From the Inside Out - Effective Ways to Manage Stress from Ready2Go Marketing Solutions, Inc. Imagine, for a moment, driving your car through city traffic at the height of rush hour. It’s stressful. You are eager to get to your destination, yet everyone is in your way. The traffic is so bad that you begin to realize you are going to be late. You begin to think about the reactions you’re going to get when you arrive late. As you imagine this scene, what do you notice about your physical reaction? Are you breathing shallowly? Has your heart rate increased? Have any of your muscles tightened? Even though you are only imagining this situation, you most likely felt some sort of physical shift, even if it was the slightest change. If so, you experienced a dose of stress. The experience of stress has become a pervasive problem that we cover up by over-working, over-eating, over-avoiding, and by using drugs and alcohol to divert us from the discomfort that exists. But what we are really struggling with is how to appropriately cope with stress. That’s what this program is for. 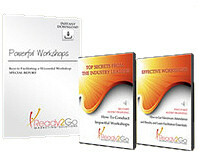 This program is about how you clients can manage the stress they experience in today’s world. 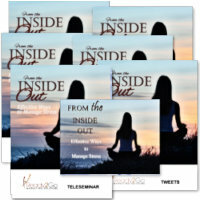 It features activities and discussions that will help them explore ways to handle stressful situations as well as uncover the benefits of managing stress mindfully. By the end of this program, participants will have identified the two types of stressful situations, the four approaches to managing stress, and dozens of techniques for managing stress. Part I – What Can You Gain From Stress Management? This component provides opportunity for participants to identify a current source of stress in their lives. Part II – How Do You Respond to Stress? This component places participants in a vicarious, acute stress situation – a traffic jam. Participants identify their mental and physical responses at various touch-points throughout the visualization. Participants learn a stress management technique using the breath. Part III – What are the Types of Stress? This section explores and defines two key types of stress: acute and chronic. Participants learn definitions and examples of acute and chronic stress. Participants brainstorm examples of stressful situations they would consider acute or chronic. Part IV – What are Some Stress Management Techniques? Exploration of two general approaches to coping with stress: reactive and proactive, emphasizing that both can be helpful or unhelpful depending on the situation. Participants brainstorm reactive and proactive stress management techniques for acute stress, and then for chronic stress. Part V – How Will You Manage Your Stress? Participants select one technique for each of four categories from the previous section — acute/reactive, acute/proactive, chronic/reactive, and chronic/proactive — then explore the pros and cons of each technique. Part VI – What Are the Implications of Managing/Not Managing Stress? Participants identify the ramifications of not managing stress. Participants identify the benefits of managing stress. This section recaps key points from each of the six sections.